Here again is what our bookshelf looks like all lit up with these fancy lights (keeping in mind the bookshelf is still under construction!). That’s about 16 feet of lighting. For our project, we needed two reels. These lights are available in different colors, and we opted for “Warm White 3100k,” which looks similar in color to an incandescent bulb. 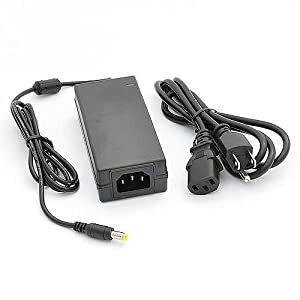 You also need to pick up a transformer/power adapter like this. We’re using two reels of light with one transformer and it works great. Once your junk comes in the mail, just follow these steps for a quick trip to luminary heaven. You just peel off the backing and the strip is already sticky, so slap that bad boy where ever you want. Each of our bookshelves has a little lip underneath it, because the shelf itself is made of 3/4-inch thick wood, but we nailed a thicker piece of trim on the front to make the shelves look chunkier. We stuck the lighting to the inside of that lip. So in this case, the lights actually face toward the back wall of the bookshelf, know what I mean? You can plug the transformer into the wall and you’ll have LIGHT. But if you want to connect more sections of light (like we did when we created a new section for each shelf), things get a little more complicated. Stick your next strand where you want it. 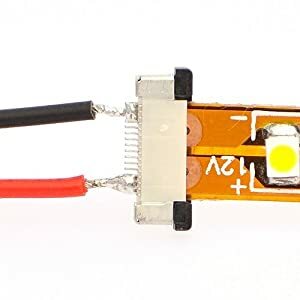 Using two pieces of 12-volt wire from your local home improvement store, solder the wire to the pads on the light strip. Make sure you connect the positive side of one strip to the positive side of the other strip. At this point, you can stop where you are, plug in the transformer to the wall and you’re set. Or you can continue connecting different light sections until your whole house is illuminated. We just stuck ours on the top shelf up against the wall, and you can’t see it. If we were installing under-cabinet lights in the kitchen, we would probably hide it inside one of the cabinets. If you have a wall-mounted microwave, the cabinet above it usually has a power source you can use, and you can leave the transformer there permanently. Most of these instructions assume you have a general knowledge of electricity and have soldered before, but if you don’t and you’re handy, you can learn how to solder pretty quickly by watching videos online and you can buy the same $10 soldering iron we have here. Also, pretty please don’t do anything with electricity if you don’t know what you’re doing, because electricity can kill you and I’d rather have you stick around. No matter what, don’t plug in your transformer while you’re soldering. Email me or leave a comment if you have any questions about how we’ve done it, but please be careful. But you still want to be able to connect multiple sections of light, you should be able to use these connectors instead, but we’ve never used them and can’t vouch for them. These lights are dimmable using a $6 dimmer like this, but we opted not to do that for our bookshelves. Go on with ya fancy self. One of my most popular posts is this $4 pantry lighting solution. These lights would actually work better than what we have there, and we probably would’ve used them instead if we knew about them. There are TONS of handy uses for these things! There’s also a waterproof version of these lights that could be pretty fantastic outside on a patio, deck or near a pool. Or stick some behind your bathroom mirror for a fancy glow. Because these lights are only 12 volts, they could even work in boats or vehicles, if you’re a baller like me. I hope this makes sense! If I’ve missed anything in the instructions that would make installation easier for you, let me know in the comments and I’ll try my best to fill in the gaps. Good luck with your adventures in illumination! UPDATE: See how we used these LED lights to make a lamp run on batteries. P.S. : Check out our other lighting projects here, and more of our handy tutorials right here. I’m filing this post away for my future built in bookcases, Kelly! Thanks for sharing and girl, you could never be boring!!! Hi! I am wondering if you used a switch of any kind on your bookshelf lighting? The transformer plugs in, so do you have to unplug it every time you want to turn out the undercabinet lights? Thanks so much! I don’t own a soldering iron, but I know how to use one (I took a metalworking class in college). I want to put these lights everywhere!!! Thanks for the links & tutorial!! Okay, so you lost me at “soldering”, but I’m still filing this away for my future kitchen. It looks like an excellent solution for under cabinet lighting. These look amazing. The bookshelf was beautiful before, but the lighting takes it to a whole new level. Great job! Hmm…. very interesting, I never seen those before! Thanks for sharing! The history of dust. HA! Thanks for this, this is so good to keep in mind. I love how the shelves look like they glow. Damn, I wanted it to be easier than this. I am the handyman in our house and I’m not sure that soldering is in my future. But then again, you never know. I was trying to figure out how you hid the 12v wire in the bookselves as it looks like you drilled through your shelf in the first picture you have of the strip hung (dwarf pic). Where did that wire go to remain hidden and out of sight? Oh good question! The tall vertical columns in the bookshelf are actually hollow. All the lights are connected to 12v wires that go through tiny holes that we drilled in the side of the vertical columns at each shelf. The wiring runs up to the top shelf and connects (through another drilled hole) to the transformer there. So essentially all of our wiring lives in those thick vertical columns and stays hidden there. I hope that makes sense! That makes a lot of sense- I should have gone back through the photos to deduce that. I’m sorry, I’m such a visual person. Are you saying that each light on each shelf is attached to its own wire that runs in the hollow vertical posts? And at some point near the top they all are joined together to plug into the transformer? Is there a way you could possibly sketch what the wiring looks like? This is EXACTLY what I need to modify my IKEA Hemnes glass door cabinets in the dining room! Thank you so much! Yep, I think I’ll also file this one away under “Projects for Rick.” He would understand every bit. We could definitely use this in our dining room hutch! Thanks so much for the tutorial….sounds pretty doable. I also went and checked out your $4 light fix! So glad you like creamy and crunchy peanut butter! LOL! I wish I was a tiny dwarf sitting on your shelf, learning everything as you go! Instead, I’ll pin this and go back to this great tutorial when we finally install lighting under our cabinets. Thanks! Amazing Kelly, thank you so much for sharing. I know these things often come with instructions, but never simple ones and these steps are so easy. This is awesome! We’ve talked about doing this because the lighting in our kitchen is so poor. Thanks so much! I probably want to do this in shelves at our house someday but the best part of this post is your humor, you crack me up! What a great idea. I know I’ll be using this one! Thanks for the detailed instructions. Can’t wait to read about your cabinetry! Great idea. I’m on it. Currently we have Ikea under cabinet lighting and they get far more hot than I like and use too much electricity. This is such a great idea and I ‘can’ solder. Win-Win! I hope I haven’t missed something here so you don’t have to repeat yourself. But I’m wondering how you were able to plug so many wires into your transformer? Am I missing something? I may be a little confused. If you cut extra strips for each shelf, and soldered wires to each one, how do you plug ALL those wires into one transformer? I hope I’m making sense. How would your installation of the lights have changed if you decided to do it before almost completing the shelving? It looks like that’s the best, if not only, way. Just curious (since I’m in the process of doing mine). Hi Melissa, Just sent you an email, let me know if you didn’t get it! Thanks for this great article – I just came across it, and it’s very close to a project in our own home office. We’ll be using 3-4 of the LED rolls, so it’s very helpful seeing your pictures and results. How did you connect the strands from multiple strands together? Did you connect them all together at the transformer? If so, did you solder them all together, and then to the female connector? Have you had any problems with the transformer? The link has some negative reviews, so I’m wondering if it’s still working fine for you. Love your site! I enjoy your articles and your humor! You can connect the end of one strip to the beginning of the next by soldering a wire between them, or you can connect them all directly from the transformer. We saw those negative reviews on the transformer but haven’t had any issues at all. Best of luck! Thank you for the quick reply! My order of lights and transformer arrived, and the lights are even brighter than I expected. This is a project I’ve wanted to do since moving. The shelves themselves are just pieces of wood, so I’ll trim them down first and add front facings. This will beef them up a bit and give a place to hide the lights. Thanks so much for your tutorial — seeing your approach and the results were exactly what I needed. I saw this project sometime ago and saved it for future use, guess what I am just about to do build something similar to the bookcase in the article. You answered a query from Mellissa by email about joining a number of cut strips at the transformer. Can you send me the same info? Wow…I hate to be a copy cat but can I get the Kelly=>Melissa=>David=>Me email about connecting each shelf of lights. You are awesome! Thanks for a great post. I’m redoing my TV lounge and will definitely use these ideas to add accent lighting behind the TV and the surround sound speakers. Do these LED lights give off any electrical interference that may affect the TV signal? Nope, shouldn’t be a problem! I’d love to see pics when you get them installed! So I found your blog via Pinterest and I want to do everything! ;o) Such neato ideas – keep ’em coming! We want to add shelves on that big empty blank wall you see when you go down the steps to the basement and wanted to light them but didn’t know how. Thanks for the wonderful directions and links to sites to buy the lights and transformers. We’ll be lighting that boring stairway in no time. Do you know how long this lighting will last? I have some fiber optic lights and they are guaranteed for 1000 hours. Thanks for the great post. I’m not sure yet. We’ve had them for about 9 months now and they’re still going. I’m not sure if they come with any guarantees. We have these led light tapes all over our kitchen. Inside cabinets (with glass doors), under cabinets to light the counter, and down at the toe kick for night lights. But, we set it up with a dimmer and the dimmer hums – not too loud but you can hear it when it is quiet. We also did leds in ceiling cans in the living room and we are getting RF interference – static – does your wizard have any suggestions about our dimmer humming and the RF interference? Thanks, love your installation . . . You write good! Thanks! Just sent you an email with a few questions to see if we can figure it out. Thanks for your tips which were very helpful. I am experimenting finding it difficult to aim the LED strips in such a way that they light up the book fronts without getting in your eyes. Tried putting at the bottom of the shelf facing upwards but on the lower shelves, the lights get in your eyes. Also, tried recessing them but they still do get in your eyes on the lower shelves since they are below. Put them in a V-groove which we cut on the floor of the bookshelves so that they would aim away from the front and onto the books, but we still see the light dots on the lower shelves. Was wondering what your experience was with your lighting solution of how the LEDs cast light on the books in the bookshelf filled with books to in the way you installed the lights? Do the LEDs throw light on the fronts of the books since the LEDs are aimed towards the back of the bookcase on the top? Would appreciate any advice. Thanks! We didn’t experiment much or really think at all about it – we just threw them up facing the back wall because it was the only way we could think to hide the lights. It does a really good job of lighting the front of the books without being visible. It probably depends though on how deep your bookshelves are and how close to the front of the shelves you put your books. Our books are all a few inches back – they don’t sit right on the front edge of the shelves – so they do get lit pretty well that way. I hope this helps! Thanks, Kelly. In the end we gave up on the idea of having a clear back to our bookcase and to use frosted glass on the back wall of our bookcase which solved many problems, and followed your method. You are right, it does shine nicely and gives good light that way. It also projects enough light on the back of the books to give a lovely glow on the back wall. And in fact, it is nicer with the frosted back as it glows nicely and you can still see the book backs. I found your blog through Pinterest (as many others seem to have) and im planning on doing this to my kitchen cabinets. I was looking on Amazon at the transformer you recommended and see a lot of bad reviews for it. Has it held up well for you? or do you recommend something else better now? Just dont want to buy it and have it fail like the reviews go on about. Other than that this looks amazing thank you! If you had a lamp with a wide enough stem you could put the batteries in there. I agree with the idea of rechargeable batteries. There are plenty of sources that you could use but you would have to get to the 12 volts and have a way to charge them. One thing I did was to take apart an old CFL bulb and use the base and soldered the whole system to that. This way you can always put a regular bulb in it if you like. When I finish, I will post photos to somewhere. OK, I’m a fan — Sign me up.! Actually, I DID just subscribe. LOVE your blog and the great Ideas you two come up.! Keep up the Good Work. SUGGESTION> RE: the cabinet lighting Do you have one for EXTERNAL lighting Effect..?!? Sidewalk (light) edging / Steps or Deck accent lighting / EMERGENCY or LED ‘Night lights’ <(for use in Power Failures). Can you steer me in the right direction — I'd like to start a similar blog. NOT as a 'competitor' — frankly you've inspired me to just 'give away' a truckload of inventions / ideas / How To's / bits & pieces of knowledge = I refer to them as: "U.L.T.B.O.I's" Seemingly, “Useless Little Tid-bits Of Information”. I am currently SO frustrated. I think I’m going to have to stop over, because for whatever reason, the only lights that are working are plugged directly into the transformer. None of the ones I connected are turning on. Uggggh. I WILL figure this out. I WILL. I WILL. Wow! Thanks for this and your other excellent lighting tutorials. I am a new follower via Feedly Reader. Have a great week! This looks great. I was looking at your tutorial on cordless lamps and I was wondering if it would be possible to make the lights on a bookshelf battery operated, and if so, how would you rig up a switch? You could (we have these lights on our bookshelves: http://viewalongway.wpengine.com/2012/01/let-there-be-fancy-low-watt-high-tech-light/ and you’d just connect them to a switch. You can buy a switch at radio shack. Good luck! Fabulous! 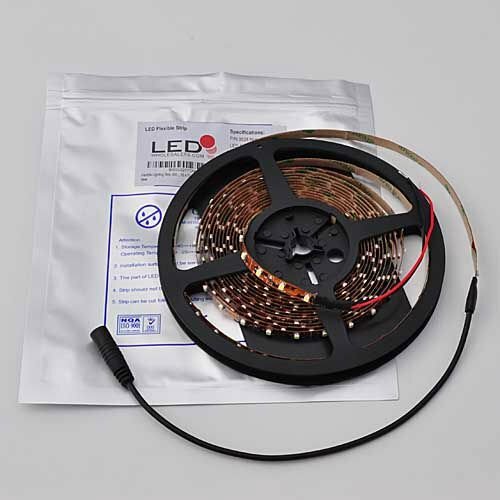 Now, if you want to put an on/off switch and are powering this light strip with batteries, what would you do differently? I’m using this terrific idea for under cabinet lighting in my camper. Whoops, I see the post right above mine asked the same question. What kind of switch? I’m a total newbie to ANY thing electrical – which is why I’ve hired guys to do my rewiring. This, I can do, I think. Has the transformer gone bad as someone had asked. I have been hearing problems with them. Just wondering before I use. Ours hasn’t — we’ve had no problems at all. I saw the reviews about problems, but ours has been perfect so far. Do you think this would work for under counter kitchen lighting when the back splash is already tiled? I’ve been told that I would have to tear out the back splash, install wiring, then re-tile. Yes, I definitely think it would. You would probably just stick it to the bottom of the cabinets and run the wiring up inside the cabinets. I don’t think it would affect the backsplash at all. I am sooooo glad I happened to find this post. I was looking for something else and can’t even remember what that was because I’m so excited to find out about this lighting. And so happy I can still buy it on Amazon! My office b0uilt-in is not as spectacular as yours, but it’s almost finished and I’ve been kicking myself for not thinking ahead and saving room for lighting. This is a perfect solution because they take up like no room. Love it! Thanks!!! No, it’s not a complete circuit. There are two separate chains of light that come out from the power source and terminate. The power supply needs to be 12v. This is perfect and just what I’ve been looking for. I have a dumb question. How did you hide the wires in between shelves? Did you drill holes? Thanks! Can’t wait to explore more of what you’ve done! Great idea! Now, to see if I can actually do it, which is another thing altogether, lol. Thanks for sharing another great idea–I love it when something is as cute as this AND saves me money-double the love! Hi Kelly, great post. Really appreciate your taking the time to lay this all out. Question — as I generally keep my books right to the edge of each shelf, including a set of Encyclopedia that really can’t be pushed much further back of the shelf (and I’d prefer to not have the edges of the books up against the back of the base) — how much of a gap do you estimate is needed between the back of back of the “lip” (the overhang of trim you’ve attached to each shelf) and the front of the books? I’m concerned that if the books are close to the light source, the effect won’t be great. Thank you for the great tutorial… I can’t wait to get started in my kitchen! Right now my kitchen cabinets have old school undermount florescent lighting that I hate and have to constantly replace bulbs and the little plastic covers keep cracking, anyway, I’d like to replace them. So I already have an electrical connection to a switch, so how would I wire the stripes to the existing electrical? Can I do this with these lights? Thanks, and I apologize if you’ve already answered this question! At the points where you have run wire and used solder to connect the strips what did you do to protect people from electric shock, use heat wrap? I don’t see any mentions as far as safety is concerned and I would think bare wire soldered between these light strips isn’t very safe.